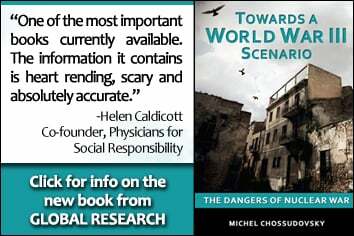 This text by Michel Chossudovsky together with the selection of articles was published in February 2012, less than a year after the onslaught of the War on Syria in mid-March 2011. Chossudovsky dispels the political consensus prevailing in 2011-2012 that the conflict in Syria was initially a protest movement which eventually developed into a civil war. Remember to bookmark this page for future reference. Please Forward the GR I-Book far and wide. Post it on Facebook. This I-Book was originally published in February 2012. The Global Research’s Online Interactive I-Book Reader, brings together, in the form of chapters, a collection of Global Research feature articles, including debate and analysis, on a broad theme or subject matter. To consult our Online Interactive I-Book Reader Series, click here. This I-Book was completed in February 2012. It was was updated (June 15, 2012) with additional articles, largely pertaining to the killings of civilians by the US-NATO sponsored Free Syrian Army (FSA). These killings and atrocities perpetrated by US-NATO sponsored death squads are casually blamed on the government with a view to justifying an R2P military intervention. The edition of this I-Book published on Global Research’s earlier website had more than 330,000 views. In this online interactive I-book, we bring to the attention of our readers a selection of feature articles on the Syrian crisis. Our objective is to dispel the tide of media lies and government propaganda, which presents the events in Syria as a “peaceful protest movement”. The “protests” did not emanate from internal political cleavages as described by the mainstream media. From the very outset, they were the result of a covert US-NATO intelligence operation geared towards triggering social chaos, with a view to eventually discrediting the Syrian government of Bashar Al Assad and destabilizing Syria as a Nation State. Since the middle of March 2011, Islamist armed groups –covertly supported by Western and Israeli intelligence– have conducted terrorist attacks directed against government buildings including acts of arson. Amply documented, trained gunmen and snipers including mercenaries have targeted the police, armed forces as well as innocent civilians. There is ample evidence, as outlined in the Arab League Observer Mission report, that these armed groups of mercenaries are responsible for killing civilians. While the Syrian government and military bear a heavy burden of responsibility. it is important to underscore the fact that these terrorist acts –including the indiscriminate killing of men, women and children– are part of a US-NATO-Israeli initiative, which consists is supporting, training and financing “an armed entity” operating inside Syria. “As the unrest and killings escalate in the troubled Arab state, agents from MI6 and the CIA are already in Syria assessing the situation, a security official has revealed. Special forces are also talking to Syrian dissident soldiers. They want to know about weapons and communications kit rebel forces will need if the Government decides to help. The Free Syrian Army (FSA) is a creation of the US and NATO. The objective of this armed insurrection is to trigger the response of the police and armed forces, including the deployment of tanks and armored vehicles with a view to eventually justifying a military intervention, under NATO’s “responsibility to protect” mandate. A NATO-led intervention is on the drawing board. It was drafted prior to the onset of the protest movement in March 2011. According to military and intelligence sources, NATO, Turkey and Saudi Arabia have been discussing “the form this intervention would take”. US, British and Turkish operatives are supplying the rebels with weapons. Britain’s Ministry of Defence confirms that it “is drawing up secret plans for a NATO-sponsored no-fly zone [in coordination with its allies] “but first it needs backing from the United Nations Security Council.” (Syria will be bloodiest yet, Daily Star). According to these secret plans: “fighting in Syria could be bigger and bloodier than the battle against Gaddafi”. (Ibid ). There is certainly cause for social unrest and mass protest in Syria: unemployment has increased in recent years, social conditions have deteriorated, particularly since the adoption in 2006 of sweeping economic reforms under IMF guidance. The later include austerity measures, a freeze on wages, the deregulation of the financial system, trade reform and privatization. (See IMF Syrian Arab Republic — IMF Article IV Consultation Mission’s Concluding Statement, 2006). Moreover, there are serious divisions within the government and the military. The populist policy framework of the Baath party has largely been eroded. A faction within the ruling political establishment has embraced the neoliberal agenda. In turn, the adoption of IMF “economic medicine” has served to enrich the ruling economic elite. Pro-US factions have also developed within the upper echelons of the Syrian military and intelligence. But the “pro-democracy” movement integrated by Islamists and supported by NATO and the “international community” did not emanate from the mainstay of Syrian civil society. The wave of violent protests represents a very small fraction of Syrian public opinion. They are terrorist acts of a sectarian nature. They do not in any way address the broader issues of social inequality, civil rights and unemployment. The majority of Syria’s population (including the opponents of the Al Assad government) do not support the “protest movement” which is characterised by an armed insurgency. In fact quite the opposite. Ironically, despite its authoritarian nature, there is considerable popular support for the government of President Bashar Al Assad, which is confirmed by the large pro-government rallies. 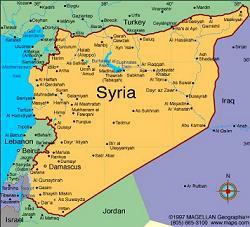 Syria constitutes the only (remaining) independent secular state in the Arab world. Its populist, anti-Imperialist and secular base is inherited from the dominant Baath party, which integrates Muslims, Christians and Druze. It supports the struggle of the Palestinian people. The objective of the US-NATO alliance is to ultimately displace and destroy the Syrian secular State, displace or co-opt the national economic elites and eventually replace the Syrian government of Bashar Al Assad with an Arab sheikdom, a pro-US Islamic republic or a compliant pro-US “democracy”. The insurgency in Syria has similar features to that of Libya: it is integrated by paramilitary brigades affiliated to Al Qaeda, which are directly supported by NATO and Turkey. Military sources also confirm that Syrian rebels “have been training in the use of the new weapons with Turkish military officers at makeshift installations in Turkish bases near the Syrian border.” (DEBKAfile, Ibid). Recent reports confirm that British and Qatari Special forces are on the ground in the city of Homs, involved in training rebel forces as well as organizing the supply of weapons in liaison with the Turkish military. As in the case of Libya, financial support is being channelled to the Syrian rebel forces by Saudi Arabia: “Ankara and Riyadh will provide the anti-Assad movements with large quantities of weapons and funds to be smuggled in from outside Syria” (Ibid). The deployment of Saudi and GCC troops is also contemplated in Southern Syria in coordination with Turkey (Ibid). This recruitment of Mujahideen was part of NATO`s strategy in Libya, where mercenary forces were dispatched to fight under the helm of “former” Libya Islamic Fighting Group (LIFG) Commander Abdel Hakim Belhadj. The Libyan model of rebel forces integrated by “Islamic brigades” together with NATO special forces has been applied to Syria, where “Islamist fighters” supported by Western and Israeli intelligence are deployed. In this regard, Abdel Hakim`s LIFG brigade has now been dispatched to Syria, where it is involved in terrorist acts under the supervision of NATO Special Forces. US Ambassador Robert S. Ford was dispatched to Damascus in late January 2011 at the height of the protest movement in Egypt. (The author was in Damascus on January 27, 2011 when Washington’s Envoy presented his credentials to the Al Assad government). At the outset of my visit to Syria in January 2011, I reflected on the significance of this diplomatic appointment and the role it might play in a covert process of political destabilization. I did not, however, foresee that this destabilization agenda would be implemented within less than two months following the instatement of Robert S. Ford as US Ambassador to Syria. The reinstatement of a US ambassador in Damascus, but more specifically the choice of Robert S. Ford as US ambassador, bears a direct relationship to the onset of the protest movement in mid-March against the government of Bashar al Assad. Robert S. Ford was the man for the job. As “Number Two” at the US embassy in Baghdad (2004-2005) under the helm of Ambassador John D. Negroponte, he played a key role in implementing the Pentagon’s “Iraq Salvador Option”. The latter consisted in supporting Iraqi death squadrons and paramilitary forces modelled on the experience of Central America. It is worth noting that Obama’s newly appointed CIA head, General David Petraeus played a key role the organization of covert support to rebel forces and “freedom fighters”, the infiltration of Syrian intelligence and armed forces, etc. Petraeus led the Multi-National Security Transition Command (MNSTC) “Counterinsurgency” program in Baghdad in 2004 in coordination with John Negroponte and Robert S Ford at the US Embassy in Baghdad. More generally, the Western media has misled public opinion on the nature of the Arab protest movement by failing to address the support provided by the US State Department as well as US foundations (including the National Endowment for Democracy (NED)) to selected pro-US opposition groups. Known and documented, the U.S. State Department “has been been funding opponents of Syrian President Bashar Assad, since 2006. (U.S. admits funding Syrian opposition – World – CBC News April 18, 2011). The protest movement in Syria was upheld by the media as part of the “Arab Spring”, presented to public opinion as a pro-democracy protest movement which spread spontaneously from Egypt and the Maghreb to the Mashriq. There is reason to believe, however, that events in Syria, however, were planned well in advance in coordination with the process of regime change in other Arab countries including Egypt and Tunisia. The outbreak of the protest movement in the southern border city of Daraa was carefully timed to follow the events in Tunisia and Egypt. In chorus they have described recent events in Syria as a “peaceful protest movement” directed against the government of Bashar Al Assad, when the evidence amply confirms that Islamic paramilitary groups are involved in terrorist acts. These same Islamic groups have infiltrated the protest rallies. Western media distortions abound. Large “pro-government” rallies (including photographs) are casually presented as “evidence” of a mass anti-government protest movement. The reports on casualties are based on unconfirmed “eye-witness reports” or on Syrian opposition sources in exile. The London based Syria Observatory for Human Rights are profusely quoted by the Western media as a “reliable source” with the usual disclaimers. Israeli news sources, while avoiding the issue of an armed insurgency, tacitly acknowledge that Syrian forces are being confronted by an organized professional paramilitary. The absence of verifiable data, has not prevented the Western media from putting forth “authoritative figures” on the number of casualties. What are the sources of this data? Who is responsible for the casualties? Escalation is an integral part of the military agenda. Destabilization of sovereign states through “regime change” is closely coordinated with military planning. There is a military roadmap characterised by a sequence of US-NATO war theaters. War preparations to attack Syria and Iran have been in “an advanced state of readiness” for several years. US, NATO and Israeli military planners have outlined the contours of a “humanitarian” military campaign, in which Turkey (the second largest military force inside NATO) would play a central role. We are at dangerous crossroads. Were a US-NATO military operation to be launched against Syria, the broader Middle East Central Asian region extending from North Africa and the Eastern Mediterranean to the Afghanistan-Pakistan border with China would be engulfed in the turmoil of an extended regional war. There are at present four distinct war theaters: Afghanistan-Pakistan, Iraq, Palestine and Libya. An attack on Syria would lead to the integration of these separate war theaters, eventually leading towards a broader Middle East-Central Asian war. In Part I of the online interactive I-Book, an introductory essay is presented. Part II examines the nature of the US-NATO-Israel sponsored insurgency, including the recruitment of terrorists and mercenaries. It also includes an examination of a 1957 Anglo-American covert intelligence plan to destabilize Syria and implement “regime change”. The 1957 plan envisaged the triggering of “internal disturbances as well as the mounting of “sabotage and coup de main (sic) incidents” by the CIA and MI6. What this essay suggests is continuity, i.e. today’s Intel. Ops, while more sophisticated than those of the Cold War era, belong to realm of DÉJÀ VU. Part III examines the complicity of the “international community” focussing respectively on the role of non-governmental organizations, the dynamics within the United Nations Security Council and role of the Arab League, acting on behalf of Washington. Part IV centers on the insidious role of the corporate media, which has carefully distorted the facts, providing systematically a biased understanding of the causes and consequences of the Syrian crisis. Part V focusses on the broader military agenda and the process of military escalation in the Middle East. The road to Tehran goes through Damascus. A US-NATO sponsored war on Iran would involve, as a first step, a destabilization campaign (“regime change”) including covert intelligence operations in support of rebel forces directed against the Syrian government. A war on Syria could evolve towards a US-NATO military campaign directed against Iran, in which Turkey and Israel would be directly involved. It would also contribute to the ongoing destabilization of Lebanon. It is crucial to spread the word and break the channels of media disinformation. A critical and unbiased understanding of what is happening in Syria is of crucial importance in reversing the tide of military escalation towards a broader regional war. A “Humanitarian War” on Syria? Military Escalation. Towards a Broader Middle East-Central Asian War? The road to Tehran goes through Damascus. A US-NATO war on Iran would involve, as a first step, a destabilization campaign (“regime change”) directed against Syria. VIDEO: US-NATO “Humanitarian Intervention” in Syria: Towards a Regional War? Recent developments in Syria point to a full-fledged armed insurgency, integrated by Islamist “freedom fighters” covertly supported, trained and equipped by foreign powers. Syria and the Russia-China Veto: Towards a Break Point at the UN Security Council? Media Lies Used to Provide a Pretext for Another “Humanitarian War”: Protest in Syria: Who Counts the Dead? Media Lies: Syria’s President Bashar Al Assad Sets ABC News Senior Propagandist Barbra Walters Straight. Israel, Syria, and Lebanon Prepare the “Home Fronts”. The Levant could be the starting point of a major international conflict, with global ramifications, which could quickly spin out of control. US military doctrine envisages the central role of “massive casualty producing events” in which innocent civilians are killed. The killings are carried out as part of a covert operation. The enemy is blamed for the resulting atrocities. “Humanitarian War Criminals” in High Office: Was the Houla Massacre Ordered by the Western Military Alliance? Who is behind these rebel groups? What is the precise nature of the relationship between the FSA and the Western military alliance? What is the command structure? What is the nature of this diabolical covert operation? Who ordered these atrocities against the Syrian people? The terrorists were not pro-government shabbiha militia as conveyed, in chorus, by the mainstream media, they were in large part mercenaries and professional killers operating under the auspices of the self-proclaimed Free Syrian Army (FSA). Michel Chossudovsky is an award-winning author, Professor of Economics (Emeritus) at the University of Ottawa. He is the Founder and Director of the Centre for Research on Globalization (CRG), Montreal and Editor of the globalresearch.ca website. He is the author of The Globalization of Poverty and The New World Order (2003) and America’s “War on Terrorism”(2005). His most recent book is entitled Towards a World War III Scenario: The Dangers of Nuclear War (2011). He has taught as Visiting Professor at universities in Western Europe, South East Asia, Latin America and the Pacific, acted as an adviser to governments of developing countries and as a consultant for several international organizations. Prof. Chossudovsky is a signatory of the Kuala Lumpur declaration to criminalize war and recipient of the Human Rights Prize of the Society for the Protection of Civil Rights and Human Dignity (GBM), Berlin. He is also a contributor to the Encyclopaedia Britannica. His writings have been published in more than twenty languages. This Online Interactive I-Reader is made available to Global Research readers with a view to curbing the flow of media disinformation and war propaganda. Our ultimate objective is to reverse the tide of war and restore World peace. The tragic events of September 11, 2001 constitute a fundamental landmark in American history. a decisive watershed, a breaking point. 9/11 opens up an era of crisis, upheaval and militarization of American society. The dumping of highly radioactive water into the Pacific Ocean constitutes a potential trigger to a process of global radioactive contamination… Eventually all major regions of the World will be affected.